The purpose of this Project in Lieu of Thesis was to create a ceramic resource for art educators. My research focused on the use and development of ceramics in the art education classroom. I was motivated to create this resource due to the small number of comprehensive resources available for PreK-12 art teachers interested in using clay in the classroom. I formed a partnership with several art educators to determine their specific needs regarding incorporating clay usage into the art curriculum. With this information, as well as my own knowledge of the material and processes, I created a website to educate teachers in the ceramics arts. The website includes sections addressing the importance of clay as an art material, technical skills, use of clay in the classroom, proper kiln usage, enrichment, educational resources, contemporary artists, and a blog. In addition to the informative text, I have included photos, instructional videos, links to lessons, and potential resources. The outcome is an informative, relevant, and easy-to-navigate website. This project is important to the field of art education because it will simplify what has been considered a time-consuming process that dissuades art educators from using clay. The website may be viewed at www.ohhappyclay.org. 3 ACKNOWLEDGEMENTS I would like to thank my family, friends, and my supervisory committee who help ed guide and support me through this journey. 7 resources. The outcome is an informative, relevant and easy to navigate website. This project is important to the field of art education because it will simplify what has been considered a time consuming process that dissuades art educators from using clay. The website may be viewed at www.ohhapp yclay.org. 8 CHAPTER 1: INTRODUCTION I first experienced clay as a child walking along the shore of Lake Michigan. This material could have been easily mistaken for a rock. When I picked it up and pressed it into my hands, it moved and for med different shapes. I spent my days walking the beach and digging in the sand to find more of this material When the clay was form ed it was left to dry along the sea wall at my home. This magical experience during my childhood created a deep passion for the ceramic arts. As a child, my experiences in art class were much different than the experiences I had at home. Art class was a neglected subject if it could even be considered a subject at all. In middle school, the uncle of one of the girls in my cla ss would sometimes come on Friday for a thirty minute art lesson. It averaged out to maybe once or twice a month. I remember only one experience with clay in school during all of middle school, and I have no memory of being able to keep the piece I created The experience involved rolling, flattening, and fastening little balls of clay to one another to create a tall vessel that I had hoped would hold flowers. With clay, it seemed I had the potential to make anything. However, in art class I felt restricted ; I was rarely given the opportunity to work with clay and was often only provided two dimensional art materials. 20 different from that of two dimensional media (Golomb 200 2; DeMuro, 1992; Smilansky, 1988; Grossman, 1980; Douglas & Schwartz, 1967). Warchowiak and Clements (2001), authors of the book Emphasis Art support Golomb by dedicating a chapter to the importance and use of clay in the art classroom. Ash (2000) sugge sts that sculpture is a neglected discipline and supports the use of clay because of its unique ability to activate the senses in a way that two dimensional work cannot. He encourages the active participation of the viewer and creator of three dimensional work. Teachers and researchers advocate the use of clay for many different reasons ranging from sensory learning to developing cognitive and affective skills for learning. Meng (2002) and H ack (2009) have found that their students are enthusiastic, eager and enjoy learning when working with clay. Walkup (2005) supports it for the enjoyment of the teacher and student, and Warick (2005) for the scientific knowledge that can be gained. Similansky, Hagan, and Lewis (1988) conducted a field based research proj ect with 1,600 children using clay in the classroom. The results support the notion that clay can promote the development of learning skills and allows for a different type of representation than drawing offers. Their book provides everything from teaching strategies to managing clay in the classroom. 24 Graphic Design major at the University of Florida provided guidance in the development of designing the website. We worked together to upload the theme into WordPress while making specific adjustments. L ydia Challenger a senior Photography major at the University of Florida took photographs to supplement the content of the website. The website includes the following categories: clay, technical skills, clay in the classroom, kiln, enrichment, educational resources, contemporary artists, and a link to the blog. The information to create each section was gathered after deciding which categories to include. The section on Clay provides an introduction to the material, how it is formed, and the different type s of clay (Figure 3 2). Each section includes a bibliography and recommended readings to guide the reader to further research. The section on clay also includes a subsection on Why Clay is a valuable material to be used in education. 25 Figure 3 2 Clay Th e section on Technical Skills gives the reader a basic introduction of ceramic techniques. These techniques include Handbuilding, Wheel throwing, Molds, Glazing, Surface, and Image Transfer (Figure 3 3). Each section is linked to a PDF that can be download ed. It is important that these files are downloaded, as PDF's to preserve the integrity of the project. 26 Figure 3 3 Technical Skills The section on Clay in the Classroom provides an introduction to the preparations that need to be made before using clay in the classroom (Figure 3 4). It includes section s on Materials, Tools, Ceramic Suppliers, Classroom Setup, Safety, and Reclaiming Clay The Materials section explains the different types of clay bodies, which are earthenware, stone ware, and porcelain. I t also gives recommendations for clay and glazes for classroom u se. The Tools section provides photograph s descriptions and links to tools used in ceramics. 29 kilns are included E lectric kilns are more commonly foun d in the art education classroom therefore photos of both programmable and manual electric kilns are shown. Specific images correlate with each type of kiln. The section on Cones and Firing Temperatures explains what a cone is and how it functions in the kiln. There are included l inks to the Orton cone chart and a firing chart from Ceramic Arts Daily. Kiln Preparation and Care links directly to a PDF with specific directions for preparing an electric kiln for firing. It provides instructions on starting, l oading, caring for the kiln, and a link to the second video on applying kiln wash posted on Vimeo. The last kiln section outlines How to Fire a Kiln It includes both bisque and low fire glaze firing schedules for programmable and manual kilns. 30 Figure 3 6 Kiln The Enrichment section was created in an effo r t to gather relevant educational experiences available beyond traditional education (Figure 3 7). This includes Organizations, Ceramics Enrichment Opportunities, and Student Opportunities The section on Organizations is link ed to Pinterest where I include organizations and web based groups that support the use of clay in the classro om. Ceramics Enrichment includes links to art and craft schools and artist's residencies. 32 countries are cited. There is also a link to a Pinterest board that focuses on Art Museums that have a significant ceramics collection. Figure 3 8 Educa tional Resources My board on Pinterest provides links to Contemporary Ceramic Artists working with different materials and techniques. This board is a resource for both teachers and the students. The board can be viewed at http://pinterest.com/jenigard/contemporary ceramic artists/ (Figure 3 9). 37 wor k with educators to update my website content through conversations and interviews. I intend to continue posting current ceramics information on the blog keeping an open communication with readers. 38 References Ash, A (2000). Sculpture in secondary schools: a neglected discipline. In N. Addison, & L. Burgess (Eds. ), Learning to teach art & design in the secondary school: A companion to school experience (210 219). New York, NY: Routledge. Brown, E. V. (1975). Develop mental characteristics of clay figures made by children ages three through the age eleven. Studies in Art Education 16 (3), 45 53. Brown, E. V. (1984). Developmental characteristics of clay figures made by children: 1970 1981. Studies in Art Education 26 (1), 56 60. De Muro, T. (1992). Making a case for clay in the art room. Unpublished master's thesis, Columbia University Teachers College, New York, New York. Douglas, N., & Schwartz, J. (1967). Increasing awareness of art ideas of young children throug h guided experiences with ceramics. Studies in Art Education, 8 (2), 2 9. Froebel, F. (2005) The education of man. (W. N. Hailmann, Trans.). Mineola, NY: Dover Publications. (Original work published 1826) Golomb, C. (2002 ). Child art in context: A cultura l and comparative perspective Washington, DC: American Psychological Association. Golomb, C. (2004). Sculpture: Representational development in a Three dimensional medium. In E. Eisner, & M. Day, (Eds. ), Handbook of research and policy in art education (329 358) Mahwah, NJ: Lawrence Erlbaum Associates, Inc. Golomb, C. (1974). Young children's sculptures and drawings. Cambridge, MA: Harvard University Press. Griffith, L. (1959). The importance of ceramics in the United States today. Unpublished master 's thesis, New Haven State Teachers College, New Haven, Connecticut. Hill, J. (1988). An historical analysis of and speculations about the value of clay working in American education. Unpublished master's thesis, Columbia University Teachers College, New York, New York. 39 Meng, K. (2002). An elementary curriculum based on ceramics from around the world. 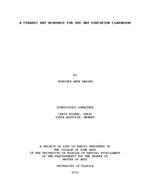 Unpublished master's thesis, Georgia State University. Roland, C. (2012). Art Education 2.0: Connecting art educators around the globe. Retrieved from http://arted20.ning.com/ Smilansky, S., Hagan, J., & Lewis, H. (1988). Clay in the classroom: Helping children develop cognitive and affective skills for learning. New York, NY: Peter Lang Publications, Inc. Tillander, M. (2012). UFARE 2.0: UF Art Educ ation faculty, alumni, students and friends. Retrieved from http://ufare20.ning.com/ Walkup, N. (2005). Not just clay. School Arts, 104 (8), 30. Warwick, S. (2005). The science of clay. School Arts, 105 (3), 28 29. Wachowiak, F., & Clements, R. D. (2001). Emphasis art: a qualitative art program for elementary and middle schools. New york: Longman. Williams, G. (Eds.). (1988). A case for clay in art education. Studio Potter 16(2), 17 72. Williams, R., & Tollett, J. (2006) The non designer's web book: An easy guide to creating, designing, and posting your own web site. Berkeley, CA: Peachpit Press. 40 BIOGRAPHICAL SKETCH Jeni Hansen was born and raised in West Michigan, the state that resembles a mitten She grew up living in a Bed & Breakfa st that her parents still own and operate on the Lake Michigan shoreline. Jeni's mother was a nurse and her father was a teacher. She was always a very energetic child who enjoyed playing with clay and doing cartwheels anywhere she could. After graduating from high school in 2003, Jeni attended Hope College to pursue a degree in Art Education with an emphasis in ceramics. After completing her undergraduate work, she taught at the secondary level serving as a high school art teacher, yearbook teacher, newspa per advisor, and cheerleading coach. She is currently a graduate student at the University of Florida and has been a Graduate Teaching Assistant since 2010. She teaches the lab component to "Art for the Elementary School Teacher," which is a course design ed for Elementary Education majors. She has been an active member in multiple organizations including National Art Education Association (NAEA), Handbuilt or Wheel Thrown Clay (H.O.T. Clay), and Arts and Health. Her fianc Forrest Gard, is pursuing his MF A in Ceramics at Louisiana State University. They will marry June 2012 and look forward to their life together that will always be surrounded by the wonderful messiness of clay!